$1 Pink Plastic Forks, Spoons & Knives Cutlery 24ct. $1 Silver Plastic Forks, Spoons & Knives Cutlery 24ct. 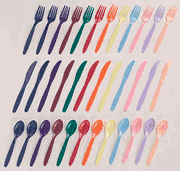 $1 Lavender Plastic Forks, Spoons & Knives Cutlery 24ct. $1 Light Blue Plastic Forks, Spoons & Knives Cutlery 24ct. $1 Yellow Plastic Forks, Spoons & Knives Cutlery 24ct. $1 Pink Plastic Teaspoons 24ct. $1 Pink Plastic Knives 24ct. $1 Green Plastic Knives 24ct. $1 Silver Plastic Knives 24ct.